It happened near the Shell Factory on Saturday, January 19th. LEE COUNTY, Fla. -- Troopers say two people are dead and another was injured when a motorcycle collided with a pedestrian in Lee County on Saturday. It happened just after 6pm on U.S. 41 at Leesure Lane, near the Shell Factory. 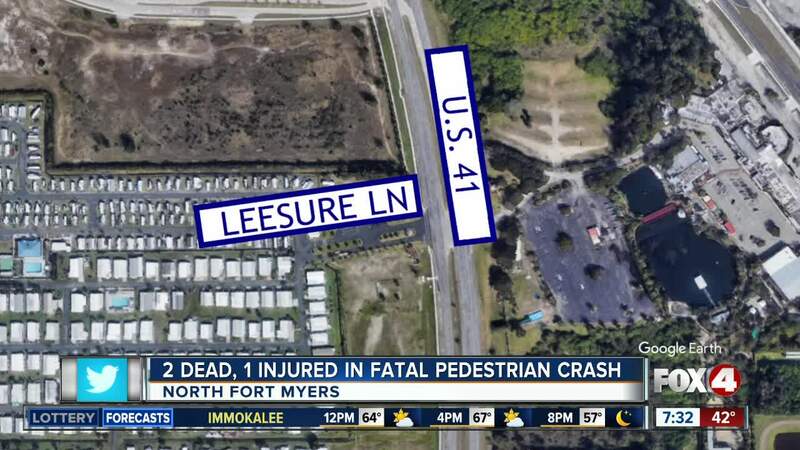 According to Florida Highway Patrol, 49-year-old Roger Miller was riding northbound on U.S. 41 with a passenger when he struck a pedestrian who was attempting to cross the highway. Miller was pronounced dead at the scene, and his passenger, 49-year-old Amy Melick, was seriously injured. The pedestrian, 70-year-old Pauline Griffiths of Ontario, Canada, was pronounced dead at the scene as well.